It was the perfect airborne death machine—a supersonic drone of nearly unlimited range, loaded with hydrogen bombs zooming around Earth at more than 2,500 miles per hour. To the engineers who worked on its development, it was “technically sweet” and the high point of their careers. This story originally appeared onSept. 7, 2014. Developed between 1957 and 1964, the Supersonic Low Altitude Missilewas one of the craziest, deadliest nuclear weapons systems ever pursued. The locomotive-sized cruise missile would loiter at high altitudes above the Soviet Union, before dropping down to treetop level and roaring across enemy territory at Mach 3. Then it would lob nuclear bombs at everything in its path. Were it ever completed, the missile likely would have worked. But the success of several experimental designs turned out to be the project’s ultimate doom. The SLAM missile also overcame several interesting engineering challenges. During the 1950s, the vast power and endurance of nuclear energy seemed ideal for powering fast, long-range rockets and airplanes. In theory, a nuclear-powered airplane could stay aloft for days, or fly at incredible speeds without refueling. But nuclear reactors are heavy. The shielding required to keep a flight crew safe from radiation makes building a nuclear-powered flying machine challenging, to say the least. From 1956 to 1957, the Air Force experimented with an airborne reactor as part of its Nuclear Airborne Propulsion program. The reactor took up one whole bomb bay of a modified B-36 bomber while the crew sat in a 12-ton lead and rubber-shielded cockpit. While the nuclear aircraft program wrestled with complicated plumbing and tons of shielding, the SLAM project dispensed with the crew and pursued a simple but scary idea—the nuclear ramjet. A ramjet is a jet engine that moves so fast, the air entering its combustion chamber becomes hot and dense enough to ignite fuel. The resulting explosion of hot gas pushes the ramjet—and its attached vehicle—to supersonic or even hypersonic speeds. Though simple in design, a ramjet is tough to build and operate. Rockets and conventional turbojet engines must first accelerate a ramjet-powered aircraft fast enough before the ramjet can kick in. Ramjets also require special materials to resist intense heat and pressure. And they gulp fuel like a drag racer. But if made small, light and tough enough, a nuclear reactor could solve the fuel consumption problem and give a ramjet-powered vehicle enormous range. In 1957, what is now the Lawrence Livermore National Laboratory began a program to create such as a reactor, known as Project Pluto. To learn more about the project, we talked to Joe Behne, a retired engineer who works at the National Atomic Testing Museum in Las Vegas. Behne worked at the Lab and the Nevada Test Site assigned to the Project Rover nuclear rocket program. He then moved to Project Pluto and stayed aboard for the duration. Behne’s broad engineering background prepared him for work on the non-reactor components of Pluto. After serving as an aviation electronics technician in the Navy during World War II and Korea, he studied aeronautical, mechanical and petroleum engineering at Texas A&M University. Project Pluto created two prototype test engines. Though the Pluto reactors were tiny—smaller than 10 feet in length and diameter—they required a railroad car’s worth of equipment to simulate a working ramjet engine. Fuel for the Pluto reactors used enriched uranium mixed with beryllium, cast into cigarette-sized hollow rods of porcelain. The project demanded a lot of porcelain. Tory II-C, the second test reactor, used over 460,000 fuel elements. With no crew safety concerns, and no need to keep the weight down, the engineers didn’t bother shielding the radioactive engines. Instead, engineers built an assembly building at the Nevada Test Site with eight-foot-thick concrete walls and remote manipulators. 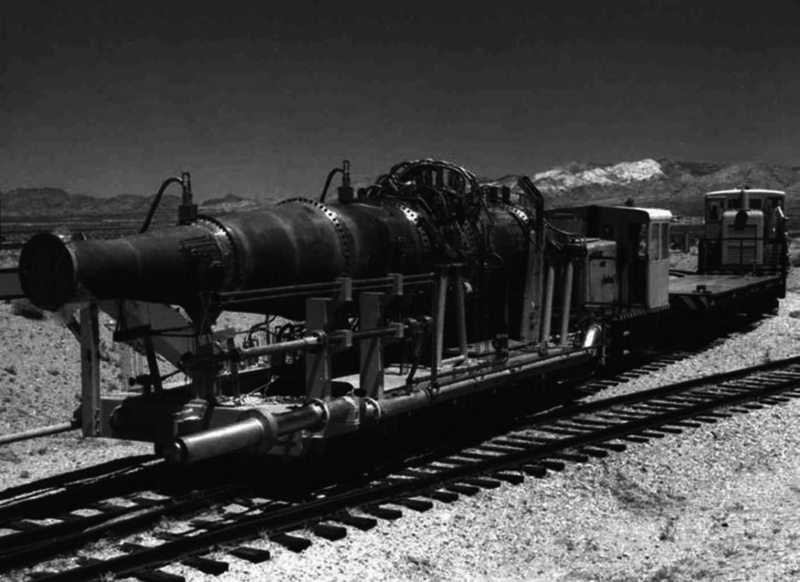 A remote-controlled railroad moved the engines to a test stand two miles away in the desert. Testing the engines required an air source equal to the incoming air an actual flight engine would encounter. This required heating the air to 1,300 degrees Fahrenheit at several hundred pounds per square inch—moving at supersonic speeds. That’s a lot of hot air. Project engineers laid 25 miles of oil-drilling pipe as a tank farm and borrowed huge compressors from the Navy to fill them up. The air flowed into the test engines through giant steel drums full of a million steel ball bearings heated by oil burners. Even with all this gear, the system only held enough air to operate for a few minutes. Behne was the lead engineer on both the Tory II-A and Tory II-C test engines, in charge of the entire machines—except for the reactors themselves. Indeed. The Tory reactors themselves ran at 2,500 degrees Fahrenheit. Some metal parts holding the reactor and ceramic fuel elements heated up to within 150 degrees of their ignition points. It was so hot, lead bricks used to hold down rail car components melted into puddles. One temperature solution came from an unlikely source. Pluto engineers found exhaust-manifold paint at a hot rod shop that proved ideal for protecting control mechanism electric motors. In 1961, workers fired up the Tory II-A test engine for a few seconds at a fraction of its rated power. The machine worked, and Ted Merkle—the project’s hard-charging technical director—immediately pressed forward with an improved design. Three years later, in 1964, the improved Tory II-C engine ran for five minutes at full power, pumping out 560 megawatts of heat and almost 19 tons of thrust. Project Pluto was a great success—experiment-wise. An all-ceramic Tory III engine shaped up on the drawing boards. But the project never led to a real weapon. It was simply way too crazy. Escalation worries loomed large. If the United States deployed SLAM, why wouldn’t the Soviets build their own nuclear ramjet weapon? The SLAM missile was also becoming obsolete. Newly-deployed intercontinental ballistic missiles could reach targets in minutes, not hours. Although extensive testing showed that guidance and control systems could survive the incredible radiation generated by the nuclear ramjet, the military had not yet tested the missile itself. Plus, how do you test a radioactive, Mach-3 missile? Plans called for launches over the Pacific followed by hours-long test flights above remote open waters. Test missiles would crash into the Mariana Trench, taking their “hot” reactors seven miles down to the bottom. All well and good, but these were test flights—problems would almost invariably crop up. Suppose the guidance system failed and a missile roared over friendly territory? If the range-safety officer destroyed it in flight, you still had a supersonic nuclear mess on your hands. Even if the missile worked as designed, it also violated the recently-signed Atmospheric Test Ban Treaty. An open-cycle engine like the nuclear ramjet exhales radioactive air and dust-sized bits of nuclear fuel as it roars along, and no technology available then or now could clean it up. In short, the Pluto engine was a flying Chernobyl. The Pentagon cancelled the SLAM program and Project Pluto in 1964 just as the Vietnam War and the Moon race heated up. Pluto’s big team at Livermore disbanded and dispersed to other projects, mostly nuclear weapons. Eight years after the Tory II-C’s successful test, Behne visited the machine in its bunker where it awaited disassembly and shipment to the Hanford Nuclear Reservation in Washington State. “Even eight years later it was so ‘hot’ we could only stand near it for a minute or two,” he says.